The candle in the scarlet-painted candlestick was burnt low and had a shroud. The bottle-candle was high and gave a good light. Spring and evening sky showed between undrawn cotton curtains. Mrs Brown sat on a stout mahogany chair before her dressing-table, and Velvet knelt behind her unhooking her dress from neck to waist at the back. The dress was dark blue rep, built firm. It was like unhooking the strain on a shrunk sofa-covering. Hook after hook Velvet travelled down till at last she reached far below the waist. Then Mrs Brown stood up and the dark blue dress dropped to the floor, leaving her in a princess petticoat like a great cotton lily. The strings of this, untied at neck and waist by Velvet, disclosed her in bust-bodice, stays and dark-blue cloth knickers. observations: The life described in this book is very strange: the family lives next to a slaughter-house, and they are plainly quite working-class in some ways, though with aspirations. Enid Bagnold herself was not at all working-class – apparently she is Samantha Cameron’s great grandmother – but although this book is completely fantastical and unreal in many ways, the setting is not, and is very convincing – you wonder how Bagnold knew. ’ought to get whalebone,’ said Mrs Brown, sniffing at her own economy. She should have had her corset made of coutil, which we learned in this entry stops the bones poking through. Of all the gnomic and strange exchanges in the book, this is one of the most interesting. The mother is most unusual in fiction in being extremely loving and supportive, but having very little to say. But she still dominates the book, and is quite the creation. The image of the shrunk sofa-covering is wonderful. Links on the blog: The book has appeared before, on Grand National day of course. For more Dress Down Sunday, click on the label below. From a similar era: Miss Pettigrew considering corsets and whalebone. 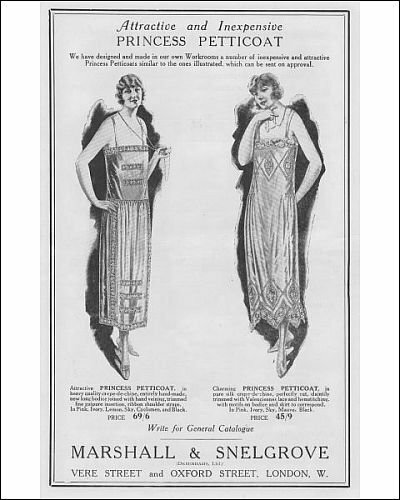 The pictures are an advert for petticoats and a 1933 entry in the Spirella corset catalogue. Looking (as I do) at many pictures of underwear, I have decided that there was some weird respectability issue, and so the items are often shown over when they should be under, as you say. A moment's thought about the practicalities of the day would tell you what's feasible and what isn't, once the stockings are attached (her above is going to have a big problem soon). And I feel I have never really grasped the princess line - I can remember other girls talking about it in primary school, and not wanting to admit that I didn't know what it was. Is it too late to learn...? Imagine a time when ads were so misleading (ok, not so hard) but a time when one couldn't google for a YouTube to show one hue to correctly layer one's undergarments. How did they work it out?! And - Marshall & Snelgrove!!!! 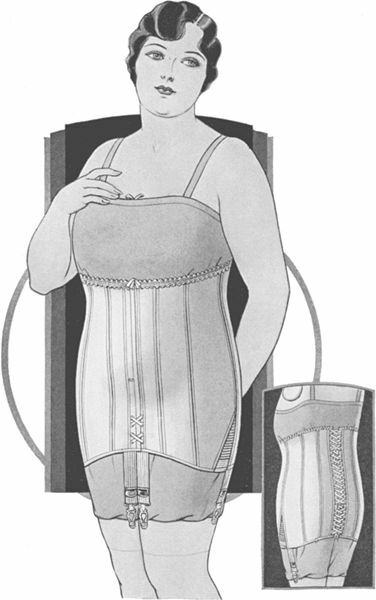 There were new types of undergarments introduced in the 1920's and 30's, and the way they were combined might vary. The Spirella picture looks like she's wearing cami-knickers under her stays. They are short and button together at the crotch so one is able to get to the loo without having to disassemble the whole structure. Older style drawers were just two legs on a waistband for that very reason, but as skirts got shorter, closed drawers were worn and had to be put on OVER the corset for obvious reasons. The description of Mrs. Brown's outfit sounds structurally very old-fashioned for 1934. Obviously a conservative woman who did not patronize fashionable dress-makers. And she was looking into the past if she thought she was going to find whalebone. Cheap steel boning did have sharp ends tipped with rubber and cloth which wore off. Spirella, on the other hand, used boning made of flattened coils of spring-wire with brass caps on the ends which could not cut through. Moira - Oh, I'm so glad you're looking at this one. Even if it isn't exactly realistic, it's such a childhood mainstay! And I have to say I do love riding ('though I haven't done it in a long time), so I always empathised with Velvet. Special thanks to Ken for all of the really useful information. I didn't read this one as a child, and to read it as an adult is quite disorientating, but it is a great book, and one most unlike other children's books.